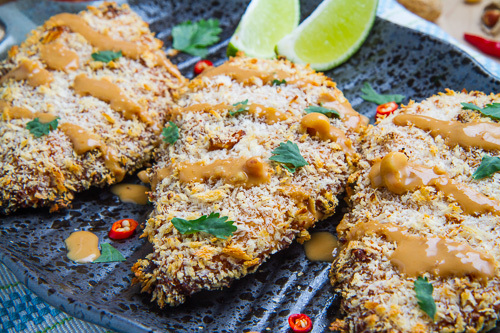 Chicken coated in a spicy peanut sauce and covered in panko breadcrumbs that is baked until golden brown and crispy. Recently I have been changing some typically deep fried dishes into healthier versions by coating them in panko breadcrumbs and baking them until golden brown and crispy. Normally I get the panko breadcrumbs to stick to the food by first dipping it is egg or an egg based batter but a when a reader asked about egg-less alternatives, it got me to thinking. When I made the Pad Thai shrimp burgers on the weekend the peanut sauce on them led me to the though of coating chicken in a Thai style peanut sauce follwed by the breadcrumbs and then baking them, which sounded so amazingly good! 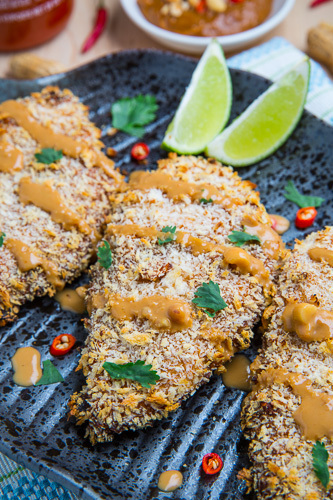 I am completely addicted to peanut sauce so I hardly needed an excuse to make a healthy baked crispy chicken dish with it! The recipe for this crispy baked peanut chicken is really easy, you pretty much just thin the peanut sauce down until coats the chicken with just enough to get the panko breadcrumbs to stick and then bake until crispy and golden brown! 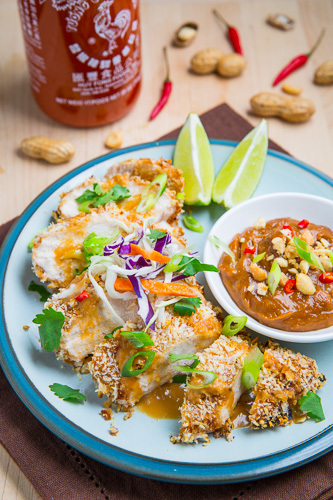 All I have to say about this peanut chicken is that you have to try it! The peanut sauce works amazingly well at holding the breadcrumbs onto the chicken and the breadcrumbs bake up nice and crispy! Of course that does not even come close to being as good as all of the flavour that the peanut sauce adds to the mix! This spicy peanut coated crispy baked chicken is easily tasty enough to devour all by itself, or with a drizzle of even more peanut sauce, but you should probably at least try to include some other things in the meal by serving it on pasta, rice, quinoa etc. along with some vegetables or even in a sandwich. 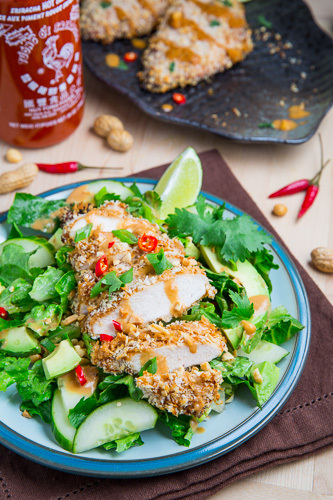 I like to serve this crispy baked peanut chicken in a simple salad with lettuce, cucumber and avocado with a peanut dressing that is made by adding lime juice and more water or coconut milk to the peanut sauce to thin it out to dressing consistency. Dip the chicken in the mixture of the peanut sauce and coconut milk followed by the bread crumbs, place them on a rack on a baking pan and bake in a preheated 400F/200C oven until cooked and golden brown, about 15-20 minutes. Serve with extra peanut sauce by itself, over rice, pasta, quinoa, or in a sandwich, salad, etc. Note: You want to add enough coconut milk or water to the peanut sauce to thin it out enough to dip the chicken into it. Option: Add 1/4 cup chopped peanuts to the panko breadcrumbs for more peanut-y goodness! Sounds awesome! I love anything Thai and anything with peanut sauce, so this is a winner for me! That looks and sounds absolutely terrific! I love oven-frying my chicken! I even oven fry avocados and all sorts of things. Love this recipe. loving the Thai theme lately! Looks delicious!! I can't wait to try this!! Thanks!! yyuum this look so fantastic! your blog is amazing! congrats your site is so good! I tried this with the less spicy sauce and it was outrageously delicious. I sure will make it again. Thanks for such a wonderful and easy recipe. Oh, I also used boneless, skinless thighs. Oh so good. This looks delicious! Perfect for summer too, thanks for sharing the recipe! This is great! And it's a "healthy" version since it's baked. Deeeelicious! Made this tonight and loved it!!! Served it with a fresh spring roll. Kevin your thai recipes are so decadent, so tasty looking–looks far better than any thai joint. Sounds sooo good! I love the idea of coating in the peanut sauce and coconut milk and using no eggs. I can't wait to try it out!